A little game made this evening, for A Game By Its Cover 2015, it doesn't really have an end point, you can just keep making constellations and finding prophecies. 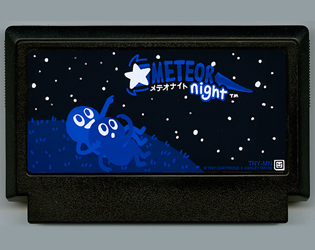 It was based on this famicase. Explore the landscape with the arrow buttons, and connect the dots of the stars with your mouse to create constellations. I quite like this idea, so maybe I'll find a way of making it into a game and will add it to the ever growing list of games that will make my fortune. Very nice start. This could be something if polished properly. Would it be possible to have the constellations descriptions fade in (and out) in the scenery, instead of in a pop-up? The pop-up breaks immersion a bit and I frequently close it by mistake. Cute! Simple, but it gets its idea across well. It'll be interesting to see it develop!